Eastbourne is a fresh collection of writing that has sprung from Wellington’s Eastern Bays. 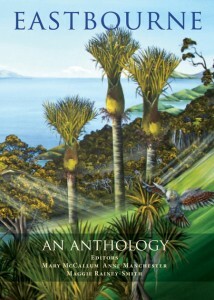 With work by acclaimed New Zealand authors and poets such as Denis Glover, Lloyd Jones, Steve Braunias, Kate de Goldi and Robin Hyde, the anthology also showcases young and emerging talent like Sarah Laing and Airini Beautrais. Unlike many literary anthologies, over a third of the work is previously unpublished. Writers with a connection to the Bays have offered stories and poems, and some with no history of publication have worked with the editors to take their submissions to publication. An extraordinary 120 authors were behind the 190 submissions and discoveries of poetry, fiction, memoir and essays the editors had to select from, with 110 pieces making the cut. The youngest authors are seven year olds Lauren Excell and Tatum Collins, and one of the oldest, in her eighties, is former Eastbourne Mayor Elaine Jakobsson who writes as poet Helen Jacobs. The anthology editors are Eastbourne writers and editors Mary McCallum, Anne Manchester and Maggie Rainey- Smith. They say the anthology is not a coffee table book but a collection of work that gets under the skin of life on the ‘other’ side of Wellington Harbour with 4,700 people living where bush meets the sea on a road that ends with Pencarrow lighthouse. Dave Armstrong writes plays for theatre, television and radio, and is a newspaper columnist. His plays include Niu Sila (co-written with Oscar Kightley), Te Tutor, King and Country, Kia Ora Khalid, Le Sud, The Motor Camp, Kings of the Gym, and Rita and Douglas. Dave writes a weekly satirical sketch Down the List for National Radio. His television credits include Skitz, The Semisis, Seven Periods with Mr Gormsby, Shortland Street, Billy, Spies and Lies, and Hope and Wire. Alan Bagnall was born 1940. Primary School teacher. He grew up in, and still lives in Mahina Bay. Alan has contributed many stories and poems to the School Journal over the years, and in 2002 his children’s book, The Immigrants, illustrated by Sarah Wilkins, was published by Mallinson Rendel. The Immigrants was shortlisted for the NZ Post Children’s Picture Book awards in 2003. Fiann Blackham has lived with his family in Muritai, Eastbourne for eight years. He likes that it’s a great place to have pets, unless you are a goldfish. Fiann’s teachers and parents have taken notice of his writing since he was 7. He is currently writing short stories in his spare time. He also enjoys surfing, drawing and playing with his cats. Mark Blackham has lived with his wife and four children in Muritai, Eastbourne for eight years. He likes that it’s small, by the sea, and that the dairy is only a bike-ride-with-the-dog away. He has misused his writing skills for an unfair advantage in public relations and politics since he was 21. He is currently owner of BlacklandPR. Mark founded Natural Burials, responsible for the start of natural cemeteries in New Zealand. He’d rather box or play rugby, but the local ROWGES writing group insist on helping him make something meaningful before he becomes a tree. Don Boswell. After completing fifty years teaching service in secondary schools, Don retired in 1998. His last appointment was as a writer for the Correspondence School. Don’s first Letters to the Editor were published in the Listener in 1948, and he has continued to write them and various articles published in publications including North and South, Guardian Weekly and Memories magazine. He says, ‘I fulfilled an ambition to write a novel after I retired but failed to attract a publisher. It has now been overtaken by events since it was about a Christchurch type of earthquake happening in Wellington.’ Don lived in Petone for his first 23 years then in London and Coromandel before returning to Wellington. He has lived in Eastbourne since 1972. Euan Burns was born in Days Bay in 1954, and lived there to 1961. He says, ‘I remember Days Bay then as a sleepy hollow – where a car on the back-roads was an anomaly and curiosity, and you could saunter down the middle of a road and across to the beach with no thought of traffic or congestion. I returned to live in Days Bay from 1968 to the mid-1980s. The Days Bay beech forest into which I frequently retreated during school days and mental illness, restored my mind to serenity and peace. The forest is, in my view, the greatest asset of the Eastern Bays.’ A collection of Don’s poems was published as Star Poems & Statements (1989). Since then he has written philosophy. William Carden-Horton. Artist. William has lived in Māhina Bay, Days Bay and along Oroua Street. He loves the unique Eastbourne atmosphere, people and nature. William designs marketing brands for clients such as Tuatara Beer, OBO and phil&teds. He also speaks about improving retail branding with his SHOPLIFTER series. His love of nature has been captured in drawings that Icebreaker uses to market New Zealand merino wool worldwide. Philippa Christmas. Painter and writer. Poems published in JAAM, Poetry NZ, and NZ Poetry Society anthologies. Short stories published in Tākahe and The Third Century (3rd prize winner). She says she once met a self-imposed challenge of completing a novel, but it remains in the ubiquitous bottom drawer. She lives in Wellington but seizes any opportunity to spend time in the bays. She says, ‘There’s still that same magic, especially in Days Bay, that I felt nearly fifty years ago as a new arrival from Dunedin.’ Painting is currently her priority, but poetry is never far from the surface. Joy Cowley, born 7 August 1936, married to Terry Coles. Wife, mother, grandmother, great-grandmother, writer, wood-turner. Divides her time between Wellington and the Wairarapa. Writes for children of all ages. John Davidson was born in Lower Hutt in 1944 and lives in retirement in Wellington. He was formerly Professor of Classics at Victoria University of Wellington, specialising in the ancient Greek theatre and the Reception of the Classics in New Zealand poetry. He is a co-author of The Snake-Haired Muse: James K. Baxter and Classical Myth (VUP 2011) and has recently published his first collection of poetry, Presence in Absence (Steele Roberts 2013). As a child and teenager he regularly spent school holidays in Eastbourne with his family, staying with his aunt Marjorie (‘Midge’) Browne who lived at 368 Muritai Road. Those times in Eastbourne remain among his happiest memories. Catherine Day. Catherine’s ancestors, George and Anne Day, arrived in Wellington from England in 1841 and settled in Days Bay. She lives on a small holding at Gladstone, Wairarapa where she works as an artist and teacher. In 2009 she graduated from Massey University, Wellington with a Masters degree in Fine Arts. Her first exhibition was held at Aratoi, Wairarapa Museum of Art and History in 2011. In 2012 she was awarded the Cutlers-Caselberg Emerging Artist Residency at Broad Bay, Dunedin and was Artist-in-residence at Wai-te-ata Press, Victoria University, Wellington. Len du Chateau. [By his daughter Carroll du Chateau] My father wrote his first poem when he was sixteen, about the same time he was chosen as halfback for the Wellington College First Fifteen. His love of writing, reading and literary pursuits combined with his passion for rugby, animals, birds and the outdoors remained the driving forces of his life. I remember Dad, who then lived in Brooklyn, telling me of his trips to Days Bay and tramping across to Butterfly Creek. Over the years he became an accomplished writer. As a young man he wrote the first short story ever published in the Listener, plus radio drama, some of it hilarious, numerous articles and short stories. He also had several poems published in the sophisticated Sydney Bulletin, a feat of which he was very proud, because of the magazine’s extremely high literary standards. Bread and butter came from advertising copywriting which he continued even as managing director of the Wellington firm Carlton Carruthers du Chateau and his poetry never stopped flowing. In later life he self-published two volumes, Let the Falcon Fly and Life and Love, which I still gift to my most deserving literary friends. Yvonne Du Fresne (1929 – 2011) was a fiction writer whose works, set in New Zealand’s Danish-French Huguenot community, are considered some of the finest literary examinations of non-British European cultures in New Zealand. According to her cousin, newspaper columnist Karl du Fresne, her experience growing up among the Danish-French Huguenot settlement of the Manawatu shaped her life and her later career as a novel and short story writer. Her themes drew heavily on her Scandinavian heritage and the stories of Hans Christian Anderson. Her story-telling father also had a great influence on her. Du Fresne’s collection of short fiction, Farvel and other stories (1980), won the PEN Best First Book Award and was read over the radio as Astrid of the Limberlost. Over her publishing career, she received a number of literary awards and scholarships in New Zealand and Denmark. She died in Wellington in 2011, aged 81. Lauren Excell is a San Antonio student aged 7 years old. Thoroughly enjoys creative writing, art, school dancing, swimming, friends and playing the piano. Annabel Fagan. I was born and grew up in Eastbourne and attended Muritai Primary and Hutt Valley High schools. At HVH I won short story competitions and was published in the school magazine. I was runner-up in The Commonwealth Short Story Competition in 2001 and read over the radio. Came runner-up in 2 other competitions and over the years, have been included in many anthologies. I lived overseas for nearly twenty years, hitch-hiking every summer and working like mad every winter. That period grew me up! I now live happily in Paekakariki. Mary Catherine Howard Findlay (neé Ensor) born 1914, died of cancer 1974. [By her son Ken Findlay] Mary’s mother died in 1927 when Mary was thirteen. She left home in 1929, after having been beaten and starved by her father, and expelled from school. Later in life she married Ben Findlay and gave birth to five children, four of whom survive today. At the time of her death she had four grandchildren, and all her descendants, along with her husband, were a source of great joy to her. In middle life she acquired greater equanimity but she never forgot the cruelty she experienced in her teenage years. She also displayed a lifelong joie de vivre throughout all adversity and as her oldest surviving son it is this quality that I most remember in her. Marion Freigard. After moving to Eastbourne in 1986, Marion first began exhibiting her watercolours; selling nationally and internationally. Later, she enjoyed working from her studio in Days Bay, with the bush featuring in many works. In 1996, Marion moved to Marine Parade in Eastbourne, where she painted a trompe-l’oeil and murals on her garden walls. Before moving to Petone in 2003, Marion’s book, Heart and Soul was published. This is a hard-backed, signed limited edition collection of her life’s poetry, illustrated with some of her watercolours. Extracts of the poetry are recorded in her more recently published memoir, Surviving Sanfillipo. Both books are available, either from Nzique, Petone, Unity Books, Wellington, or ordered directly from freigard@xtra.co.nz. Marion is involved with Hutt Valley Authors’ Writers’ Group, which she initiated. Emanuel E. Garcia is a Philadelphia-born poet, novelist and physician who has resided in Rona Bay, Eastbourne, since 2007. His books include Sherlock Holmes and the Mystery of Hamlet, The Case of the Missing Stradivarius, Twenty-Four Caprices for Violin, One Hundred Poems, and Wandering Bark. In addition to his creative writing he has authored numerous articles on psychoanalysis and the psychology of creativity and has been featured on Radio NZ and BBC radio for his work on musical composers. Jill Harris grew up in Takapuna, North Shore. She has a B.A. in English literature from Auckland University and an M.A by thesis in Librarianship from Victoria University. She and her husband spent three years teaching English in a university in Central Java where the first two of her three sons were born. She later taught English in Auckland schools and was a librarian in academic and research libraries in Wellington before retiring to write fiction for children, poetry and liturgies. She is the author of three books: Sil (Longacre Press, 2005), which won an Honour Award in the 2006 New Zealand Post Children’s Book Awards, and was listed as a 2006 Storylines NZ Notable Book; Missing Toby (Longacre Press, 2007); and At the Lake (HarperCollins, 2011), which was also listed as a Storylines NZ Notable Book. Suzanne Herschell, formerly a Hutt teacher, has lived in Eastbourne for 43 years, painting from her Pukatea Street home studio and writing poetry while parent to four children. Following her ethos of sustainability she has kept a productive vegetable and fruit garden and hatched her own chooks. An avid collector of recipes, cooking for family and friends using her own produce is another creative activity she enjoys. Suzanne’s poems have been published in NZ Poetry Society’s A Fine Line and the Ghazal Page. She previously won and this year judged the Nelson Poetry Day prize. Suzanne is an Artist Member of the NZ Academy of Fine Arts and former arts administrator with a history of involvement in group, solo, selected and invited exhibitions. Her work is held internationally in private, public and corporate collections. She has been both the recipient of art awards for contemporary painting and a selector and judge of awards. Working in oil, acrylic and watercolour Suzanne conducts a continuing conversation via image and word about land connections and identity in Aotearoa. Jenny Hessell is the author of more than thirty children’s books. She is probably best known for her Grandma McGarvey stories – the longest single-character series in New Zealand publishing. Jenny’s books are sold internationally, both in English and in translation, and she has been the recipient of the Choysa Bursary for Children’s Writers, a Goodman Fielder Wattie Award and the AIM Children’s Book Honour Award. Her stories have been published in the School Journal, broadcast on National Radio and adapted for the stage. In 2011, Jenny moved to a converted studio on her family’s property in Sorrento Bay, Eastbourne. Julian Heyes is Professor of Postharvest Technology at Massey University. He was born in the UK to a Kiwi father and British mother. Julian is co-author of over fifty scientific articles but enjoys the different challenge posed by creative writing. He has never fully abandoned his dream of becoming a short story writer and is particularly proud of his two published entries in Brian Edwards’ ‘Worst opening sentence of a novel’. Julian is an infrequent Day Tripper to Eastbourne and loves the ferry ride over the harbour, including one memorable trip for his wife’s grandmother’s 90th birthday. Lillian Hetet. I remember many joy-filled weekends spent as a child in Eastbourne and never imagined that as an adult I would live and write from above the bus barn. My sisters and I fondly recall Norah Childs who nursed the then elderly Mr and Mrs Hannah, Reg Ellingford who owned a shoe store in the village and Mr and Mrs Cryer who kindly lent us their bagatelle board to play with. They were real life characters in my childhood memories of Muritai more than four decades ago. Eastbourne contains my first published piece of writing and I am grateful to have been included. Sharing the thrill of writing as part of a writer’s group with a handful of fellow wordsmiths who live around these bays has also been a great encouragement and delight. Several decades of my working life have been spent writing course materials for educational institutions, teaching at tertiary level and working in the arts and tourism. I currently earn my living as a contract writer and editor. I am also working on a book about my parent’s artistic collaboration, a personal memoir and a growing collection of ‘Imaginings’ that I hope to publish one day soon. D.S. (Don) Long is a children’s book editor and writer. He lives in Days Bay. With Witi Ihimaera he edited Into the World of Light and Te Ao Mārama. His children’s books include A Quilt for Kiri, A Gift for Aunty Ngā, Mum’s Octopus, The Lacquered Box and The Battlefield (the Māori version of which won the Te Kura Pounamu Award for a children’s book published in te reo Māori). Mary Longmore is a third generation Eastbournite growing up on Marine Parade as did her mother Bev Burch, whose parents Arthur & Eva Burch moved to the Bays in the early 1900s. Always dreaming of exotic adventures elsewhere, Mary couldn’t get away fast enough, eventually taking a postgrad journalism course at City University, London. She worked for newspapers and agencies in the UK, New Zealand, Australia and Bangkok, winning a Qantas Media Award for social issues feature-writing at Wellington’s Evening Post in 2001. After 16 years, she returned to Eastbourne in 2004 with her first child and now lives with husband Bob and three children, juggling communications work with Days Bay Playcentre while trying to find time to write. Isabel McIlraith. [Written by her relative Evan McCalman.] Isabel came to Eastbourne on her honeymoon in the depths of the Great Depression, the beginning of a love affair that lasted until death 78 years later at the age of 101 (check). Brought up in Canterbury’s Little River she felt at home here. Eastbourne offered all she required by way of company, crafts, gardening and coastal and hill walks. The bus journeys she speaks of in the anthology excerpt from her book began with wartime work in the city, and were resumed a few years later when the National Museum employed her needlework skills in the preservation of their precious embroideries. Donna McLeod. Te Ati Awa,Taranaki. I arrived in Eastbourne with a 2 year old and pregnant. I left Eastbourne almost 10 years later with 6 children including a 3 day old baby. Eastbourne is my motherhood, my sisterhood, my spiritual home filled with ladies who lunch, good wine, heart friendships. I was taught aroha, manakitanga and tautoko, while growing with other young whanau. My background is in Maori performing arts with Te Ohu Whakaari. I am a playwright and poet currently writing and performing with Te Oro Haa. I now live in Motueka and am married to Paul Bennett. James McNeish, novelist and biographer, has been called “the wild card in New Zealand literature”. He has published some 25 books and plays. He is the author of Lovelock, nominated for the 1986 Booker Prize, and the multiple biography, Dance of the Peacocks: New Zealanders in Exile in the time of Hitler and Mao Tse-tung (2003), which has become a standard work in the literature of expatriatism. His memoir, Touchstones, appeared in 2012. He is currently writing about a contemporary of Lovelock who was the only Olympic athlete in 1936 in the resistance against Hitler. James McNeish was knighted for services to literature in 2011. Anne Manchester is a confirmed Eastbourner, first moving to Days Bay when she was 17. After a few years living in England in her 20s, she returned when she was 30 to raise her family, determined never to leave again. For the past two decades she has co-edited the national nursing journal Kai Tiaki Nursing New Zealand. She and Mary McCallum edited a collection of her uncle Colin Webster-Watson’s poems called Natural Zoo: poems, word-plays, performance pieces and other perorations, published by Steele Roberts in 2011.Working on the anthology has deepened her appreciation and understanding of the Eastbourne community, its history and environment. Catherine Manchester grew up in Days Bay, living there until her early 20s. She came back to Eastbourne to flat with friends on several occasions and looks back on her Eastbourne years with fondness for the lovely environment which inspired poems and her painting. She first expressed herself in poems using the sea as a metaphor, and later concentrated almost fully on her painting. She was awarded the Rita Angus residency in 1987. She lives with her musician husband and daughter in Ngaio and works out of a studio from home, set in a lovely bush environment, though she still misses the sea. Her art career has spanned several decades, with numerous exhibitions around New Zealand in private and public galleries. A six-week visit to New York to visit her uncle, sculptor Colin Webster-Watson and six months in Rome influenced her style that embodies the old and new in classical and abstract forms, usually people depicted in landscapes or architectural settings. On a recent visit with her daughter to Days Bay on the ferry, there was a shag to meet them with outstretched wings, just like the one she drew for the book. Lindsay Mitchell has lived in Eastbourne for twenty years having moved there when expecting her first child. Initially living in Miro Street, the family moved to a larger home in Nikau St to accommodate a growing family and need for a studio. Most of Lindsay’s work is commissioned portraits of people and animals using oil or pastel. She’s had three ‘Going Solo’ exhibitions at the Academy Galleries in Wellington but most recently works out of the Red Roof Gallery in Eastbourne. Technology has enabled Lindsay to work for people internationally and she has paintings in the US, Europe and Australia. Margo Montes de Oca. I am thirteen years old and I have recently left Eastbourne to live in Wellington. I wanted to write about what an amazing place Eastbourne is to grow up in, and what a close community we have. I lived in a little bungalow on Tuatoru Street, close to the beach at Robinson Bay. My childhood memories are full of swimming and body-boarding with friends, and of course wharf jumping in Days Bay. I am in Year 8 at Muritai School, where I am Head Girl. I have won the Senior RSA Essay competition twice and love to write in my spare time. Bill Oliver helped lay the foundations for current historical writing about this country with The Story of New Zealand published in 1960. His contribution to New Zealand history continued with The Oxford History of New Zealand (1981), co-edited with Bridget Williams. He was a consulting editor for the Dictionary of New Zealand Biography, for which he was the General Editor from 1983 to 1990. Stacey O’Neill is an Eastbourne artist who works from her home studio on the hills above Eastbourne, surrounded by bush and sea. She lived in Eastbourne in her late childhood then returned to have her own family 30 years ago, and has stayed ever since. Her paintings reflect the incredible beauty of the landscape, with images that take on a surreal and “other-worldly” quality, often with a subtle ecological theme. Stacey exhibits throughout New Zealand and sells many works internationally. Lorae Parry is a playwright, actress and director with an extensive writing and acting career. She was Writer in Residence at Victoria University in 1999. She has a Master’s degree in scriptwriting and was made a Member of the New Zealand Order of Merit in 2004 for services to the Performing Arts. Her plays include Eugenia and Vagabonds (Victoria University Press). Maggie Rainey-Smith has lived up the Zig Zag in Days Bay for 26 years. She is the author of two novels, as well as being a published poet, short story writer and a regular book reviewer on Beattie’s Blog. Her short stories, essays and poetry have been published in Sport, Takahē, the Listener, New Zealand Books, The 4th Floor Journal, and Radio New Zealand. Her website is maggieraineysmith.com and she blogs at acurioushalfhour@wordpress.com. Melissa Day Reid lived in York and Days Bays between 2006 and 2010. In 2009, she earned her MA in creative writing from Victoria University. Her stories have appeared in Turbine, Sport and Hue & Cry. She lives in Christchurch, and she is working on a novel for young adults and a collection of short stories. Shelley Seay has worked as a copywriter, journalist and producer for radio, television and press in New Zealand and Britain which was highlighted by winning the International Clio Award for radio copywriting, lyrics and production. While in Switzerland she taught ESOL and freelanced for five years. She has also been a freelance web writer, oral historian and for many years a history teacher in the Hutt Valley. She is currently working at Massey University assisting students with writing and studying and is developing her non-verbal skills as a painter, jeweler and bronze sculptor. She has lived in Eastbourne and the Bays for thirty years and at Sorrento Bay for the last seven. Chris Staub. I moved to Eastbourne from Ngaio as a 5 year old. My family bought a large old house on Muritai Rd. It was always referred to as the Souness’s house, even though we owned it for 12 years. It had a right-of-way on one side that went down to the beach front which gave us easy access to the sea. I started in Year One at Wellesley College and together with a group of local boys (and my younger brother Oliver), we progressed from Wellesley to Scots College. On finishing school, I moved to Auckland and I’m about to complete my apprenticeship as a Marine Electrician with a company called Yachting Developments. My poem about sailing comes from my introduction to yachting at the Muritai Yacht Club as an 8 year old. Every weekend over the summer I sailed Optimist dinghies then progressed to Starlings and when at college a 2-handed yacht called a 420. Eastbourne was a fantastic place to grow up with the hills on one side and the sea on the other. Sailing will always be part of my life. Peter Stuart lives in Eastbourne and has done so on and off for a quarter of a century. The Eastern Bays have always been part of his life as he grew up in the Hutt Valley. He is an Anglican priest, and served the parish of Eastbourne as Vicar 1971-1982. As a historian he has written a book on Edward Gibbon Wakefield’s years in New Zealand; as a theologian he has co-edited a book of essays critiquing Lloyd Geering’s approach to religion; his religious articles and papers have appeared in various publications. In his latter years he enjoys writing poetry (when he is not caught up in environmentalism and his still active priestly ministry). Hilary Tipping. Working as a full time artist living in Eastbourne, I specialise in mainly miniature paintings on Kelmscott vellum and occasionally ivory which takes the form of old piano keys or the specially cut mammoth ivory available to artists. Although I paint larger works on canvas, miniatures are my first love. The rendering of fine detail is to me a very satisfying way of portraying a myriad of subjects. A project I found fascinating was working on the book “A Capital Perspective” published by Mallinson Rendel in 2003 depicting a diverse collection of the many faces of Wellington. Nell Watson, 1924-2011, was born and raised in Palmerston North. Her childhood and the war years spent in Wellington form much of the content of her first memoir Blotting out Wisdom, published when she was 82. Nell moved to Days Bay in 1967 with her husband Allan Manchester and daughters Anne and Catherine, drawn by the spirit of Katherine Mansfield. She was a voracious reader and movie goer, and pursued interests in painting and writing. She published the second volume of her memoir, Travellers must be Content, in 2011. Colin Webster-Watson was a New Zealand-born sculptor, with an international reputation, who lived his adult life in Europe and the United States. He cast most of his work in bronze, finding inspiration in Greek and Roman mythology and the world of animals. He moved to Eastbourne in 2004 to be near his family and continued promoting his work and writing poetry. After his death in 2007, his niece Anne Manchester and Mary McCallum edited a collection of his poems called Natural Zoo – poems, word-plays, performance pieces and other perorations, published by Steele Roberts in 2011. A number of Colin’s large bronze sculptures have been gifted to Wellington, including the Tail of the Whale in Oriental Bay, Frenzy in Owhiro Bay, the Mountain of Dreams at Wellington Zoo and Race to the Sea in Eastbourne. Damien Wilkins is the author of ten books, including most recently the novel Max Gate. His awards include the New Zealand Book Award, a Montana Book Award, a Whiting Writers Award, the New Zealand Post Mansfield Prize and an Arts Foundation Laureate Award. He is the Director of the International Institute of Modern Letters at Victoria University. Damien grew up in Lower Hutt in the 1970s and was an irregular visitor to Eastbourne. Derek Wilshere. Born in Auckland in 1943, and lived in Hutt Valley since 1949 and been coming to Eastbourne since then, finally living here since 1996. A Civil Engineer specialising in Natural Resources Management with a deep interest in New Zealand literature and environment and one of the 100 notable signatories of the NZ Risk Assessment Appeal www.wiseresponse.org.nz. A serious spearfisherman I have a deep interest in New Zealand rivers, coast, sea and landscape. I have had a lifetime involvement in sport, particularly hockey. I have been a hockey correspondent with the Dominion Post, the Sunday Star Times and the Taranaki Herald. Spent nine years on the Eastbourne Community Board, three as Chair.